August 14, 2018 (Investorideas.com Newswire) Rick Mills of Ahead of the Herd discusses the current state of the uranium market and the factors that he believes are pointing to higher uranium prices. The Trump Administration is at it again. On July 18, the financial press got hold of a story that said the next target of the Trump tariffs is likely to be the uranium/nuclear energy sector. In what looks like a repeat of what happened with steel and aluminum, the White House said it would investigate whether uranium imports threaten national security, given how dependent the United States is on the nuclear fuel. If the sector is threatened—and why wouldn't it be, where 90% of the uranium needed for American nuclear reactors comes from abroad—import tariffs would likely be imposed. But this isn't really about national security, or in legal terms, section 232 of the 1962 Trade Expansion Act, which allows the U.S. government to impose tariffs without a vote by Congress if imports are deemed a national security threat. Section 232 was used to slap 25% tariffs on steel imports and 10% on imports of aluminum in March. 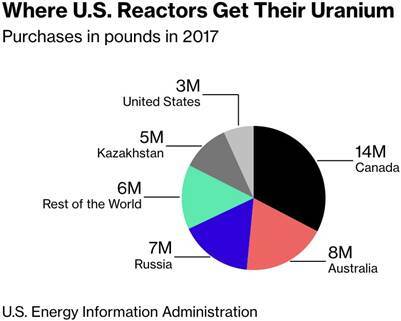 It's about two U.S. uranium producers who are fed up competing with state-owned companies in Russia and Kazakhstan (i.e., Rosatom and Kazatomprom). Energy Fuels Inc. (EFR:TSX; UUUU:NYSE.American) and Ur-Energy Inc. (URG:NYSE.MKT; URE:TSX) petitioned the government in January for the probe. Notably absent from the complaint was Uranium Energy Corp. (UEC:NYSE.MKT), which mines uranium in the United States and Paraguay and processes it in Texas. Since they supply less than 5% of the uranium needed for U.S. nuclear power plants, Energy Fuels and Ur-Energy feel threatened, and want protection. Are they likely to find a sympathetic ear in the U.S. government? You bet. Despite the prices of practically everything made from imported steel and aluminum going up, including of course, cars (GM is already losing money), this government doesn't seem to get the fact that slapping tariffs on strategic metals that are in short local supply will hurt domestic industries that must buy those raw materials from abroad. If the complaint is successful, two things could happen: a "buy American" quota that limits uranium imports and reserves 25% of the market for domestic production, or a requirement that utilities purchasing nuclear power buy U.S. uranium. We'll address the likely impact of section 232 on the uranium market in another section, but the truth is, 232 is a red herring. It's a distraction from what is really going on with uranium, which is the setting up of an extremely bullish scenario for uranium investors due to supply shortages in the face of high demand for the nuclear fuel as a result of the ever-growing need for clean power globally. The supply-demand imbalance will mean higher prices. This article will explain how this will come about, and why now is an excellent time to be investing in junior uranium companies that offer the greatest leverage to a rising commodity price. 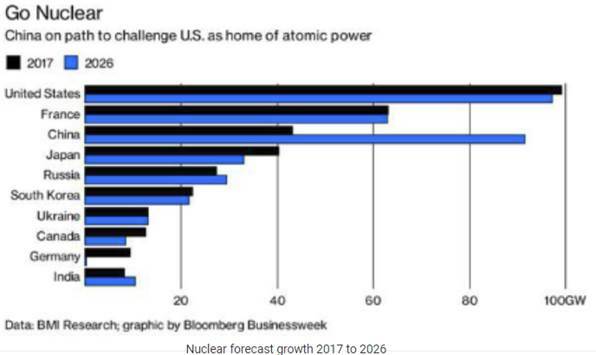 Demand for uranium, of course, is directly tied to the need for nuclear power, which is growing exponentially especially in Asia due to the problems with air pollution from coal-fired power plants. The global demand for electricity is expected to increase by 76% by 2030, and while everyone knows about the electric vehicle "revolution," what is not often talked about is how will all that extra power be generated. Much of it will have to come from nuclear. There are currently 452 operating nuclear reactors and 56 new ones under construction globally. According to the World Nuclear Association, China with its appalling air pollution is the leader with 17 new reactors under construction and 184 planned or proposed. Up until recently Japan was out of the nuclear mix, with all but a handful of nuclear reactors shut down for safety checks following damage to the Fukushima Daiichi plant during the 2011 earthquake/tsunami. But Japan, which has no oil and gas of its own and depends heavily on nuclear, now has nine reactors back in operation—a tripling from 2017—and aims for nuclear to represent just under a quarter of its power mix by 2050. Japan's Abe Administration is pro-nuclear. Russia is building nine new reactors and India is constructing seven. But there's a problem. Uranium supply has been steadily dropping since 2016. That year total mined supply was around 163 million pounds, in 2017 it was 154 million, and this year it's estimated to be under 135 million. With current U3O8 demand at 192 million pounds, that leaves a shortfall of at least 57 million pounds. 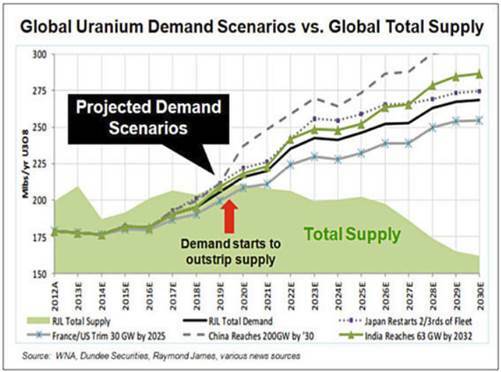 More on why that is in the next section, but first, it's important to understand uncovered uranium demand. Nuclear utilities buy uranium on long-term contracts, in order to lock in the price. These contracts usually last four to 10 years. 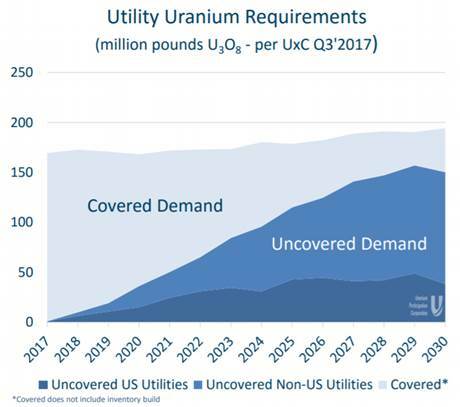 The long-term demand for uranium is calculated by figuring out utilities' requirements for U3O8 that is not covered by contracts. This is known as uncovered demand. 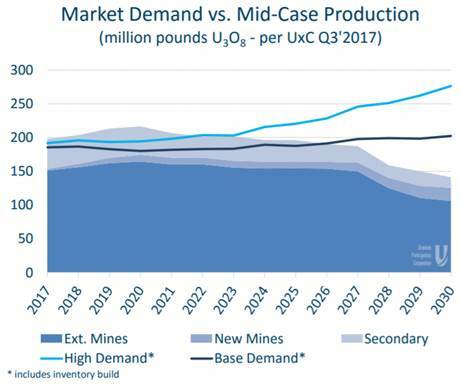 According to UxC, uncovered uranium demand is projected to increase by up to 54 million pounds by 2020, or just under a third of total demand that year. 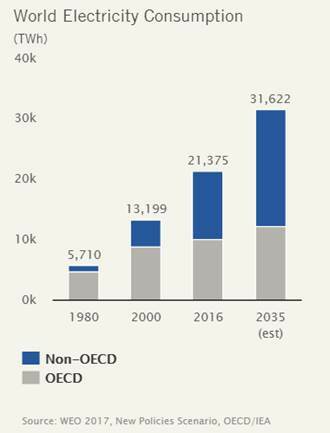 Then it just keeps rising: 150 million pounds in 2025, 179 million pounds by 2030. That 179 million pounds of uncovered demand is actually 16 million pounds more U3O8 than total mined production predicted for that year. At current prices, about three-quarters of uranium mines are uneconomic. This is why several large uranium mines have shut down recently. In 2017, operations at Cameco Corp.'s (CCO:TSX; CCJ:NYSE) McArthur River/Key River were suspended. Rabbit Lake was shut down in 2016. State-owned producer Kazatomprom announced it will cut 20% of its production over the next three years, all in the hope that decreased supply will lift uranium prices beyond the $20-something range per pound, which is below the cost of production. 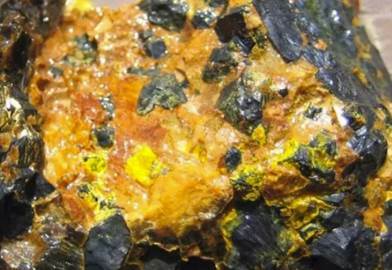 The effect was to give a short-term boost to the uranium spot price. Recently the Kazakh Energy Minister suggested that there would be another 6% production cut, to 56.2 million pounds. As mentioned, uranium mines will only produce around 135 million pounds in 2018, compared to demand of about 190 million pounds. That leaves a shortfall of roughly 55 million pounds. This shortfall could be met with secondary supply i.e., uranium that is stockpiled by governments and utilities for strategic reasons. However, much of this supply is locked up and not available for the market. It's not "mobile," meaning it cannot be counted on to add to primary mined supply. Back to the long-term contracts. Over the next seven years the majority of them are going to expire. The utilities could buy uranium on the spot market, and with the price in the low $20s, this would make sense. But heavy buying would drive the spot price higher, so they don't really want to do this. They prefer to negotiate long-term contracts at a slightly higher price, say $30 a pound. But this price is still low for uranium miners to make profits. The lowest-cost producing mine breaks even at $20 a pound. They need higher prices. How do they get higher prices? By cutting production. So uranium miners are likely to keep slashing production to drive up contract prices. There's one more factor affecting uranium supply: depleted uranium mines. Big mines like Ranger in Australia, and Rossing in Africa are running out of ore. As the grades become too low to be economic, these multi-million (annual) pound producers will scale back production, or even close down, further inflating prices. The Ranger mine operated by Rio Tinto will stop operating in 2021 and is slated for closure in 2026. Paladin Energy has cancelled a planned expansion and has shuttered its aging Langer Heinrich open-pit mine in Namibia. On top of constrained mine production, coupled with higher demand for nuclear energy as new reactors get built, there is expected to be more buying on the spot market, which is about to put upward pressure on the spot price. Let's take Cameco as an example. The Canadian producer has closed down mines, but it still committed to supplying uranium to its long-term contracts with utilities. With prices so low, it's actually cheaper for Cameco to buy uranium on the spot market than to mine it. Cameco will have to buy 8 to 10 million pounds of spot uranium over the next six months or so. This represents around a quarter of the spot market. And with Cameco just announcing that it has suspended production at McArthur River/Key Lake indefinitely, Cameco is likely going to buy even more. Second, enter a new uranium holding company aptly named "Yellow Cake." Over the last few months this London-based fund raised US$200 million in an IPO and bought 8.1 million pounds of uranium from Kazatomprom, uranium that would otherwise have been sold into the spot market. The material is being held at Cameco's storage facility in Ontario. 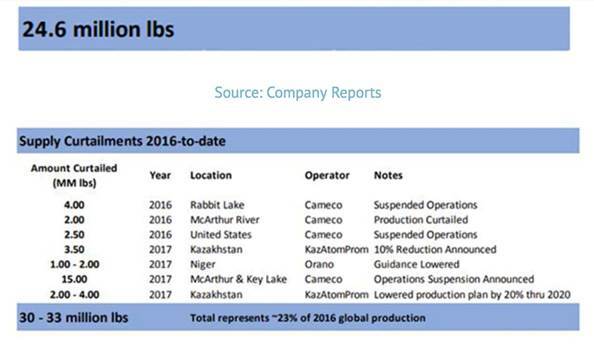 This is bound to spark an upward price reaction in the spot market, something that Cameco and Kazatomprom, which represent around 60% of the uranium market, would love to see. Cameco is a publicly traded company whose shares rise and fall with the spot uranium price. And they've just laid off hundreds of workers. State-run Kazatomprom is planning on doing an IPO on 25% of the company. They don't want to IPO with the uranium price in the low $20s. Instead, they're hoping to push it into the $30s or beyond, which would command a much higher IPO price. Back to Trump's uranium tariffs. Can U.S. nuclear utilities really be forced to buy American uranium when the country is 90% dependent on foreign imports? And could they even produce enough? The answer, of course, is no. The U.S. uses 50 million pounds of U3O8 annually but only produced 2.5 million pounds last year. U.S. nuclear utilities get the rest of what they need from Canada, Australia, Russia, Kazakhstan and Kyrgyzstan. This makes the United States the most vulnerable country to the risk of uncovered uranium. While the U.S. consumes the most uranium, with its 99 reactors, it only produces enough fuel for one reactor. Even if a political threat is determined by DOC, we don't expect the US gov't to force utilities to buy up to 1⁄4 of its requirements domestically as recommended by the producers. While the US might have sufficient licensed production capacity and ample resources to cover, based on the current state of the industry we don't believe US producers are capable to increase production from an expected near 1-2 MM lbs in 2018 to beyond 12 MM lbs pa, in the absence of higher uranium prices. About 4-5 MM lbs pa of stable US production seems more likely, although again higher prices are likely required to provide production incentive. And while Russia would gladly disrupt its shipments to the U.S. in the event of a U.S.-Russia trade war, including uranium, Talbot writes that even with other importers stepping in to replace Russian imports, "it could result in rapid price appreciation." While this would be good for uranium producers and investors, it would be bad for nuclear utilities, and ultimately, power consumers. It's another unintended consequence (like the auto industry for steel tariffs) of the Trump tariffs on a domestic industry dependent on imports. Another key point: If U.S. nuclear utilities think that section 232 is going to be imposed on the uranium/nuclear sector, these companies will start buying on the spot market, where U3O8 can be purchased for cheap, because they know the price will go up if uranium tariffs come into play. In other words, the threat of uranium tariffs will put more upward pressure on the spot price. The shift in the spot market is key; with so much buying going to come into the spot market, it's only a matter of time before the price responds in kind. I've got restricted uranium supply due to shutdowns and depleted mines, steady demand due to global electrification needs and EVs, heavy buying on the spot market and a select junior uranium explorer (juniors historically offer the most leverage to a rising commodity price) on my radar screen. 1) Rick Mills: I, or members of my immediate household or family, own shares of the following companies mentioned in this article: Skyharbour Resources. I personally am, or members of my immediate household or family are, paid by the following companies mentioned in this article: None. My company currently has a financial relationship with the following companies mentioned in this article: None. I determined which companies would be included in this article based on my research and understanding of the sector. Additional disclosures/disclaimer below. 2) The following companies mentioned in this article are sponsors of Streetwise Reports: Energy Fuels and Skyharbour Resources. Click here for important disclosures about sponsor fees. 5) From time to time, Streetwise Reports LLC and its directors, officers, employees or members of their families, as well as persons interviewed for articles and interviews on the site, may have a long or short position in securities mentioned. Directors, officers, employees or members of their immediate families are prohibited from making purchases and/or sales of those securities in the open market or otherwise from the time of the interview or the decision to write an article, until one week after the publication of the interview or article. As of the date of this interview, officers and/or employees of Streetwise Reports LLC (including members of their household) own securities of Skyharbour Resources, a company mentioned in this article. Richard owns shares of Skyharbour Resources (TSX-V:SYH, OTCQB: SYHBF).